The prototype from Nottingham Trent University and Stoll GmBHknitted is based around a patch of electric-conductive yarn over the nose and mouth. This patch emits heat when charged with the electric current coming from the battery in the back of the balaclava. Whether you’re a high-performance athlete or just an exercise enthusiast, the winter months are rough. Not just because of the superficially challenging conditions, but also the increased odds of infection from heaving in a ton of cold air. While it’s impossible to change the weather, it’s not impossible to mitigate against its severity with some click innovation. Researchers at the Nottingham Trent University in the UK alongside German advanced knitting machine manufacturer, STOLL GmBH have created an electronic balaclava engineered to reduce the odds of chest infection during winter exercise; not only does it keep your bean warm, but it heats the air you breath. The technology is built around a knitted patch of electric conductive yarn over the nose and mouth; the patch emits heat when connected to an electronic current. At the back of the balaclava is just that current; a plus and minus pole to connect which a rechargeable cell battery is connected. Since the power of the current is low, the electricity can’t be felt by the wearer. When the battery is inserted, however, the areas around the mouth and nose warms up, heating up oxygen before it is inhaled. In short: the runner, or any outdoor athlete, is never letting cold air hit their lungs, as long as the battery has juice. Despite being built with electronics inside, the balaclava is fully washable and behaves like any other fabric. For a more comfortable fit, the mask features 3D-knitted pre-shape quantities. To provide visibility in the dark, there are reflective strips all around the piece. The STOLL smart balaclava won the Outdoor Industry Award in Gold in 2016–they were one of only eight that received “Gold” recognition from a pool of almost 350 outdoor industry innovations. According to the jury, who honored the product on criterion of degree of innovation, functionality, design, choice of materials and workmanship, “This really is an innovation. 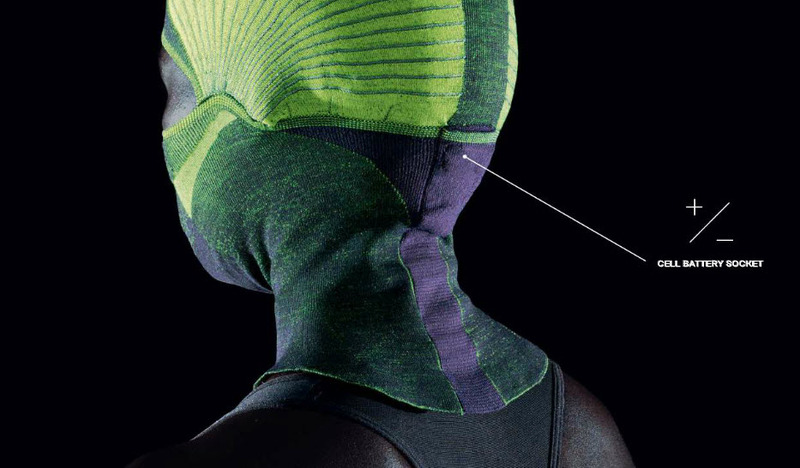 The seamless construction is great – when we tried it on, the balaclava is really comfortable and the heating system around the mouth is a fine idea.” STOLL is also applying some novel knitting technology to running tights, sports bras, bracelets and hoodies. STOLL GimbH envisions further developing their smart clothing to measure vital signs and other activity, such as ECG, breathing rate, breathing patterns, skin temperature, perspiration, bodily electrical activity, bodily motion, and gesturing. Although the electronic balaclava is currently in the prototype phase, you can expect to see more devices like it in the coming years. According to Grand View Research the global smart textiles market is expected to reach $9.3 billion by 2024, with key industry contributors being, due to inherent requirements of durability and resistance to the elements, sports & fitness and medicine. I really like to run around and stuff in the winter, but the cold air in my lungs does slow me down a little. This might be something worth checking into for my Christmas gifts! I suffer from COPD and believe that it could become standard wear for me in cold weather. That is a great point! I have a friend that is the same situation that you are in and I would really like to show this to them so they can be helped. Where can I buy this?? I get a sore throat when I breathe in cold, dry air while I’m running. This seems like the perfect solution. Very low profile, that is a huge selling point for me. I cannot wait to try this out during the cold, winters in the Midwest! I agree. This category is something that is going to be huge one day. I always wondered if it were harmful to breath in such cold air in the winter months. Thanks for pointing this out, it seems like a great fix for that!